SSL connection certified for safety of visitors' information. 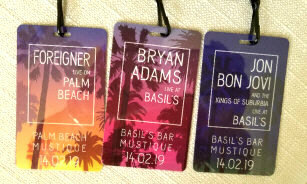 Recently, an exclusive private party enjoyed full band performances by Foreigner, Bryan Adams and Jon Bon Jovi. Get big name talent for your next special event! We can help you get a superstar to your event! Save time and effort. Send us your request. Get fast, professional service and be treated with respect and courtesy. Customer satisfaction has always been our top priority. "The Richard De La Font Agency is First Class all the way!" Thanks again Richard for a great job! I still think about how incredible the Sara (Bareilles) concert was." "Richard, you have been wonderful beyond words. to bring us a wonderful (Doobie Brothers) concert last night." This is your connection to book big name talent and celebrities for your special events! More than 48 years experience providing excellence in entertainment. More than 5200 pages on this site are user-friendly, fast loading, easy to read and easy to navigate. Please note: This is not a fan site. Fan services, such as tickets, autographs, special requests, etc., must be obtained elsewhere. Here you can find reputable and professional assistance in locating and booking regional (in U.S.), national (in U.S.) or international (worldwide) talent suitable for your event, appropriate for your audience and an excellent value for your budget. Major name artists are available for your event. Find the best talent for your budget using this celebrity talent booking service! Richard De La Font Agency, Inc., is a business-to-business resource company for entertainment, performing arts and event planning professionals. Executive-level talent booking and consulting services are provided to entertainment talent buyers (event/meeting/party planners) world-wide. This is for you if you want to book major name entertainment talent for your corporate event, private party, festival or other planned concert events. Our commitment is to provide high-quality service to talent buyers. We offer you options and provide excellent service you deserve and expect. We want you to be successful in the achievement of your goals. You have found the right place for the help you want. We offer efficient, professional consulting services to assist you with booking major talent for your event anywhere in the world. For serious booking requests only. Webmasters: Does this website offer information or services that your visitors will find interesting and useful? Click here for linking instructions! Copyright 1997-2019 Richard De La Font Agency, Inc.. Unauthorized copying, reproduction, broadcast, use or sale of any and/or all portions of this web site is strictly prohibited. All rights reserved. Images are for promotional use by Richard De La Font Agency only. Images may not be copied, modified or reused. This company acts as an entertainment consultant or broker/producer and does not claim or represent itself as the exclusive agent, representative or management of the artists listed on this site.